KATHMANDU, March 15: Eleven ministries in the new cabinet continue to remain vacant even a month after Prime Minister KP Oli came to power with the CPN-UML and CPN (Maoist Center) failing to divide portfolios between themselves and prospective partners in the ruling alliance. 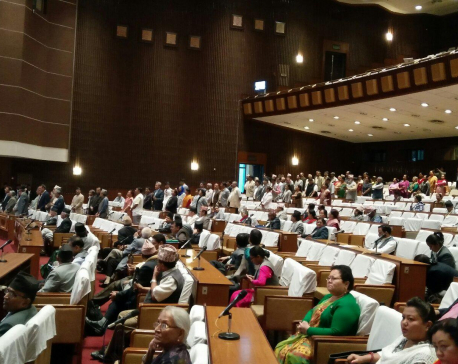 Leaders said a host of factors including internal feud in the UML and the Maoist Center and lack of progress in coalition talks with two Madhes-based parties are causing delays in cabinet expansion. This prolonged delay in cabinet expansion has not only crippled governance in the country but also highlighted the challenges facing the new government, which holds two-thirds majority in parliament. With the delay in cabinet expansion, Oli, who was appointed the head of the government on February 15, two months after he guided the left alliance to poll victory, is still overseeing the activities of the vacant ministries. Leaders of the ruling alliance said it might take some more days for the cabinet to get full shape due to the differences in talks with the Federal Socialist Forum Nepal (FSFN) and Rastriya Janata Party Nepal (RJPN), two Madhes-based parties which are in negotiation to come on board the ruling coalition. They said that the internal tussle over ministerial posts in the UML and the Maoist Center is also adding to the delay. Neither of the two parties in the alliance has been successful in selecting suitable candidates for seven ministries they are confirmed to take. More than a dozen powerful leaders within UML are in the race for five portfolios. The party is under growing pressure to induct new face and those from the Janajati and marginalized communities. While factional feud has been blamed for the UML's failure in picking ministers, Maoist Center appears to be struggling to divide fair share of power between old faces and new faces who deserted the mother party in various points of the peace process to return to the fold. Maoist spokesperson Pampha Bhusal said the confusion over the portfolios was the main reason behind the delay. She said that the cabinet would get full shape once there is clarity on the division of portfolios among the two ruling parties and two Madhes-based parties in process of joining government. Oli is in consultation with FSFN and RJPN to bring the two parties on board. While FSFN appears keen to join the government as soon power-sharing issues are sorted out, RJPN leaders said that they are still undecided on the issue. The two parties have put forth revision of the statute as a precondition for joining the government. They have also demanded a respectable share in the government. Addressing a function in the capital, Maoist Chairman Pushpa Kamal Dahal on Wednesday said that the government is inching closer to a deal on power-sharing. "The cabinet would get full shape in the next few days," said Dahal.